I have a confession to make: while I do know who Rachel Bilson is, I do not remember seeing her in anything she has done until I’ve seen her in the TV show Take Two. A friend of mine pointed out a couple of shows I’ve seen that she guest-starred in and a movie she was in that I’ve seen but my mind still draws a blank. I just haven’t seen her in anyhing memorable until her team-up with Eddie Cibrian on Take Two. I only know her from being married to Hayden Christensen but that’s about it. I never watched the OC either so I had no idea what kind of actress she is. Eddie Cibrian, on the other hand, I’ve known from his days in the late 90s on Baywatch Nights and Sunset Beach (plus, of course, the controversy when he cheated on his wife with LeAnn Rimes, who he eventually married). He’s been several other shows since then but I’ve never seen him as a lead until Take Two. Rachel and Eddie seem like the unlikely couple to pair together — but then given that the producers of Take Two also came up with Castle (which also featured an unlikely pairing), I felt that it could work. And it does. Just like Castle, Take Two has a famous person (an actress this time instead of a writer) tailing someone from law enforcement (this time a former cop/private investigator) to learn about a role, which leads to them being a permanent team investigating the mysteries that are given to them. 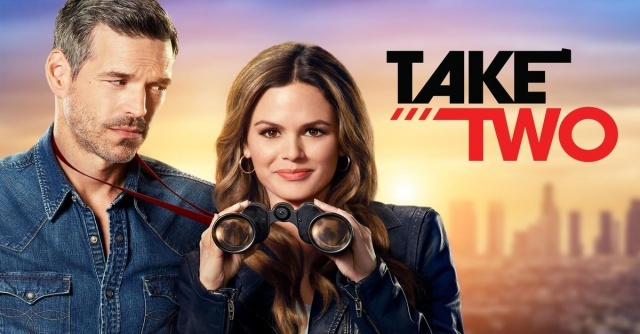 The show is far from perfect — I’m often wondering why people they investigate sometimes don’t recognize Sam Swift (Rachel Bilson) when she’s out with Eddie (played by Eddie Cibrian — the writers got lazy with the naming?). I mean, considering how famous she used to be and how ridiculous her disguises often are it seems a given that people would be able to tell who she was. And as engaging Rachel’s character can be, I feel that Eddie seems a bit too reserved in contrast. The latest episodes seem to show him opening up a bit though, which I hope will continue until the end of the season and in future seasons, if that were to happen. I think it has to do with the fact that there is more of a back story when it comes to the character of Sam Swift compared to that of Eddie (whose name I cannot pronounce or spell without making it seem like a tongue twister). If there’s anything I like about the show, it’s the moments when it gets funny and silly in spite of the serious investigations. I hope they’ll have more of that. The lighter and funnier the episodes get, the better and more entertaining the show becomes for me. I think they should go all out of the ridiculousness they have on the show and just go with it because that is what works for them. A little more sexual tension between the two leads wouldn’t hurt too. I don’t necessarily care if they get together right away (even if I want them to get together), but having more moments hinting toward that would be better as well. It would be a waste of their chemistry if they didn’t make use of it in the show. I do hope that it gets a second (and longer) season in the future. As it is, there are only 10 episodes for the first season and I don’t think that’s enough to establish anything for the show. I’d love to see more of Sam and Eddie next year, fingers crossed! Thinking of Trying Intermittent Fasting?